All this is wonderful but what do you do for the end of year test, and things the state requires you to keep how do you know you are teaching what is on those tests? Hi Ashlee – That is a good, practical question. 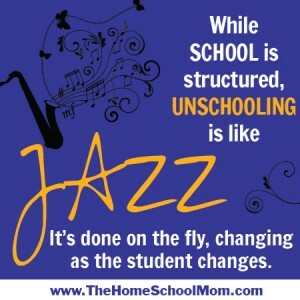 Homeschooling is regulated by the state, with states requiring everything from no evidence of progress to very structured testing. Here in Virginia, the state has multiple options for showing progress, including evaluations (which are a great option for anyone, not just unschoolers). Even if you must test, you may still have flexibility, since the results may not have be in an upper percentile. That is something that your state homeschooling statute would tell you. For example, in Virginia, if you choose standardized testing as the evidence of progress, you only have to submit the composite score for math and language, and it has to be above the 23rd stanine. That gives a lot of flexibility for allowing a child more freedom to learn at their own pace and according to their own interests. I recommend reading what your state requires and talking with local homeschoolers and unschoolers about how child-led learning can be evaluated if your state requires evidence of progress.